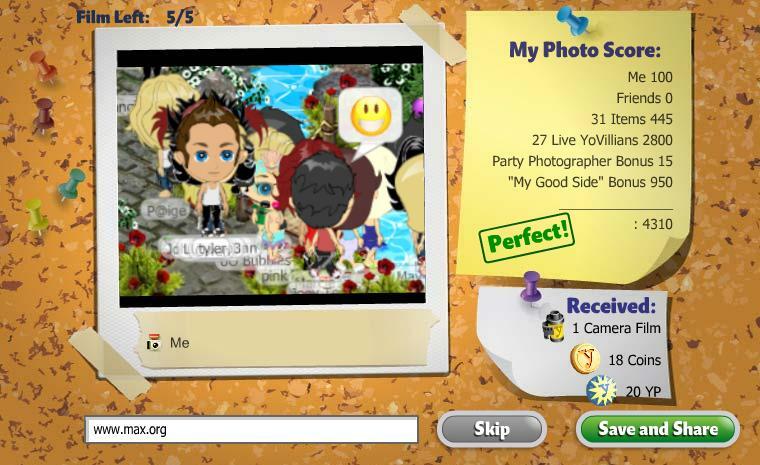 YoWorld players can take "photographs" upon clicking the camera icon, which can be found from selecting the Show Chat Bar button near the bottom right of the YoWorld screen. Players can take up to 3 shots in 5 seconds, and select the best picture from them. YoWorld will evaluate the photo and give out a score depending on various factors. YoWorld awards up to 20 coins and 20 YoPoints. The camera can store 5 "films", and 1 film is deducted for taking a picture. YoWorld refills the camera with a free film every hour. A hint from Max.org is to take photos in rooms crowded with people, or rooms that are fully loaded with items. If the picture quality is Perfect, the player may be rewarded with a free film! However, there is a limit of 1 free film per room, and up to 25 per day. If you would like to add or remove your room here, please contact the webmaster. The URL link to your home should be https://apps.facebook.com/playyoworld/index.php?d=<RoomName>-<PlayerID>. Common room names are APLiving, APBedroom and APKitchen. To find out your Player ID, visit the YoWorld Forums and your player ID (usually a 7 to 9 digits number) is shown besides your username.